Medjool dates are fruits of the date palm tree. They have deep brown color and a caramel-like flavor and can be consumed fresh or dried. So why are the Medjool dates healthiest natural sweetener? Besides that they are delicious they are also rich in minerals, vitamins, and fiber. Actually, they are real nature’s power fruit. The health benefits of this fruit are remarkable. They have been proven to boost bone health and decrease cholesterol. But there are more reasons to add Medjool dates to your diet. What makes them so beneficial and why are the Medjool dates healthiest natural sweetener? Read on. Medjool dates have higher sugar levels than many other fruits. They contain high levels of glucose, sucrose, and fructose. The body can easily utilize and process these sugars for energy. So it is a great idea to consume them for a healthy energy booster. Dates are one of the top foods for constipation relief. The Medjool dates contain high levels of fiber, which help to keep the regular bowel movements. In most cases, constipation is a sign that you need to include more fiber in your diet. But, if you have bleeding and/or severe pain, make sure to check with your doctor. Because Medjool dates are rich in soluble and insoluble fiber they can naturally lower LDL cholesterol and maintain healthy cholesterol levels. The experts recommend if you suffer from high cholesterol to include high-fiber foods, such as dates, in your diet. LDL cholesterol is the main factor that contributes heart disease, heart attacks, and stroke. So, dates are a great heart-healthy option. Medjool dates can healthy boost your heart. A study found that Medjool dates are high in antioxidative properties and that their consumption can reduce blood triglyceride levels. Medjool dates contain significantly high amounts of minerals such as calcium and phosphorus. These both minerals work together and they build up strong teeth and bones. They also fight off debilitating and painful bone diseases like osteoporosis — thus, add dates to your osteoporosis diet natural treatment plan. Calcium is the most abundant mineral in our body and is essential for the maintenance and growth of strong teeth and bones. It also keeps the nerves, muscles, heart and other body systems work properly and is best known for preventing osteoporosis. About 85% of the body’s phosphorus is in teeth and bones. It is needed for the growth, repair, and maintenance of all cells and tissues, and for the production of DNA and RNA. Phosphorus also helps balance and use of other minerals and vitamins, including zinc, magnesium, vitamin D, and iodine. Medjool dates are delicious, caramel-like fruit. They are a perfect alternative to eating a brownie or a candy loaded with refined sugar as long as you don’t overdo them. Medjool dates can be found in your nearest health or local grocery store. They come with the pit inside that can be removed very easily. Their sticky texture makes them excellent for binding ingredients together whether you are making a tart crust or granola bar. You can use them for natural sweetener in your next energy drink or smoothie. 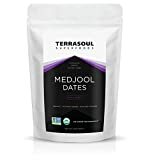 When Medjool dates are made into a paste, they become an amazing, nutrient-dense sugar substitute. You can use this paste one-to-one in most recipes (cookie, cake, muffins, and pies) to boost nutrients and cut out refined sugar. Put Medjool dates in hot water and soak until soft. Save the soaking liquid, it’s part of making a good paste! Add the soaked dates in the food processor, and one tablespoon of the soaking liquid. Mix until smooth. If needed add more water to create a thick rich paste. You must get the consistency of peanut butter. This article appeared first at Health Tips Now and appears here with permission.